For the responsible adult who thinks about being prepared for the future, savings are a fixed expense that is built into the monthly budget just like car payments and insurance. For most people, though, this habit does not come naturally. It needs to be acquired and practiced. Teach your kids those saving smarts now when they’re young to help make it a lifetime habit they’ve already mastered by the time they hit their 20s. 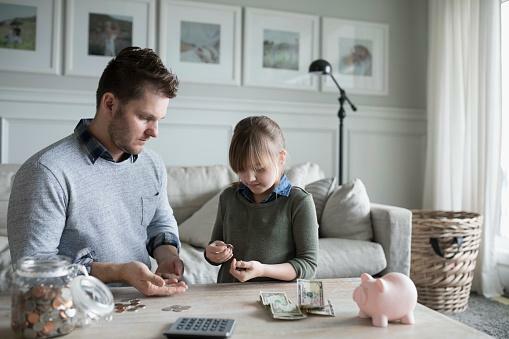 This month’s goal: Give your kids a clear understanding of why saving is crucial to financial wellness and how to make it happen. Let’s say you’ve only got $15 and you want to buy a drone that costs $65. You get $5 a week as your allowance. How can you buy that drone? When did you wait for something and find that it was more enjoyable because you waited for it? Can you think of some things that Mom or Dad saves up for? If you earn $0.10 for every dollar you save, how much money will you earn by putting away $5? Are you saving up for anything important? Have you ever had to pay for something unexpected? How did you come up with the money? Some things we save for are short-term goals, and others are long-term goals. Can you name some of each kind of goal? How will we save differently for each kind? Do you think it’s smart for Mom and Dad to keep money they’re saving under the mattress? Why or why not?